Thank you to everyone who commented on the blog last week or sent me a note. Julie’s story touched many of you in different ways and it was unanimous that you all loved her Turning Grace products! This week is going to be a bit of a mash-up, no Thanksgiving pun intended! Bear with me as I share some random things as they pop into my head. Who knows, maybe you’ll get a few holiday gift ideas from my much ado about something. Oh, and I was scrolling through some pictures from the summer and thought I’d share a ridiculously easy appetizer you can throw together with things you probably have on hand. And who couldn’t use a last minute trick up their sleeve as the busy holiday season approaches? Have you tried Trader Joe’s Everything But the Bagel Seasoning? If you haven’t, you really must. Sprinkled on roasted vegetables, a baked potato or serving as the salty, garlicky top to your next avocado toast, it is one of my favorites. You could even sprinkle some on top of the appetizer I am sharing today. The seasoning has so much flavor and is incredibly versatile. I found a recipe online that uses a home made version to coat a beef tenderloin which I absolutely have to make at some point in the future. In my cooking group, the mention of Trader Joe’s can be divisive for reasons that I do understand. TJ’s does hypnotize us with its convenience, packaging and price, not to mention tempting product line. Having said that, I think I could devote an entire post to “Trader Joe” favorites because it seems like everyone has a few things from their TJ’s haul that they can’t live without, be it Pickle flavored popcorn (yes, that is a thing) or cauliflower gnocchi. 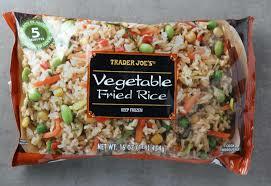 One of my faves came at the suggestion of my sister in law, Tracy which is TJ’s frozen Vegetable Fried Rice. When I am home alone for dinner or want a quick lunch, it is the easiest thing to throw in a pan and warm up. Plus it’s delicious. And because most of the time I am cooking from scratch, I don’t feel an ounce of guilt, sorry not sorry! Have you tried Halfpops? My friend, Marta told me about them, cautioning me that they are completely addictive. She describes them as the kernels that only half-pop (get it?) that we love to crunch and wish there were more of at the bottom of the bowl. Unfortunately, she also told me they are incredibly difficult to find and try as I might to buy them the old-fashioned way (searching the snack aisle at every supermarket I frequent), I have been unsuccessful and may have to resort to ordering them online. I am a popcorn lover as are our girls so I will persevere to locate these snarly snacks and report back, but if you get to them before me please comment below with your favorite flavor! Speaking of popcorn, using this kitchen tool is a game changer. We love ours and it’s a great gift for the popcorn lover in your life. I just purchased two more pairs of my favorite indoor/outdoor slipper/shoes from Birdies and have been wearing them non-stop. They are super comfortable and come in lots of colors and designs to appeal to all types. They run true to size. I also treated myself to a couple of fun winter hats from local company, Sh*t That I Knit that are super comfortable and warm although the real testing is coming today – brrr. They come in lots of vibrant colors and different styles so everyone in your family can find their perfect match. Products are knit by a group of women in Lima, Peru who work at home and earn money to support their families. I am still waiting to be notified when the Laird beanie in Lavender becomes available!!! At a girls weekend this Fall, my friend Marte introduced us to the funnest game called Telestrations After Dark. There is also the original game Telestrations which is probably a bit tamer. The game can be best described as a combination of old-fashioned “telephone” and Pictionary. We were howling with laughter and I just bought the tamer version to bring to my college roommate reunion this weekend. If you need a fun game for the holidays, it’s great for a group. While I’m mentioning my reunion, this year I offered to bring dinner to take a load off our hostess which has been the mostest for years and deserves a break. I am bringing a version of this recipe and hoping it’s as good as the reviews suggest. Circling back to Trader Joe’s, one of my friends is gluten free so since I am doubling the recipe I will make two pans, one with her favorite GF pasta from TJ’s. Let’s talk Netflix. What are you watching? I recently watched the documentary Quincy about music icon, Quincy Jones. The piece was produced by his daughter, Rashida and gives you a glimpse of his life and the tremendous impact he has had on the music industry. Loved it. The other 4-part documentary I enjoyed was Salt, Fat, Acid, Heat based on the book by Samin Nosrat. Nosrat’s book is a tomb of discovery about the impact these four elements have on the foods we eat. My favorite two episodes were the first (Fat) and last (Heat) but Nosrat is endearing and engaging throughout. Moving on to books. Without question the book that had the most impact on me this year was The Sun Does Shine by Anthony Ray Hinton. It was a difficult read at times and I am still sorting out why the book touched me the way it did. Co-written by Hinton and Lara Love Hardin, the book shares his story of surviving 30 years on Alabama’s death row for crimes he did not commit. I encourage you to read his story if you’re interested. The Lost Vintage also stood out as did The Hearts Invisible Furies. Do you have any books to recommend? Please let me know in the comments! And let’s wrap up this post with a conversation about food! After all, it’s Thanksgiving next week! I am not cooking but when I do, my Armenian Rice Pilaf and Fassoulia (Green Beans) are part of my menu. My family also loves Ina’s Mashed Butternut Squash from her Family Styles Cookbook. My stuffing recipe comes from The Gaining Ground cookbook and bears a resemblance to the sausage stuffing my mother used to make. So my favorite part of Thanksgiving, leftovers will be lost on us this year! While I enjoy reheating, I also like repurposing and recently made a simple dinner of quesadillas with leftover turkey breast (real, not deli), cheese, spinach, some dijon mustard and hot pepper jelly. My father in law was a big fan of pepper jelly and my husband and I love it too. Try it! This Turkey and Corn Quesadilla with Guacamole looks really tasty too. Finally, I am sharing with you this super simple, last minute appetizer that I have been making ever since my friend, Lucy made something very similar years ago at a gathering. It is the type of app that you can whip up at a moment’s notice using ingredients you quite possibly have on hand. This is really not a recipe but more of a guideline. The combo of the hummus with the veggies and the sharp feta cheese is addictive. I’ve named it Horiatiki Hummus because the topping ingredients are similar to those found in a traditional Greek Horiatiki salad. Yum. Add pita chips for dipping and you are done. The recipe for this appetizer is more guideline than rule. Use whatever flavor hummus you have on hand. I think almost anything could work, even a white bean dip would be nice. You could mix up the seasoning by swapping out the oregano or za'atar with some Trader Joe's Everything But The Bagel Seasoning or just use something that you love! Serve with pita chips and enjoy. On a platter, spread out the hummus in a half inch thick layer or so. 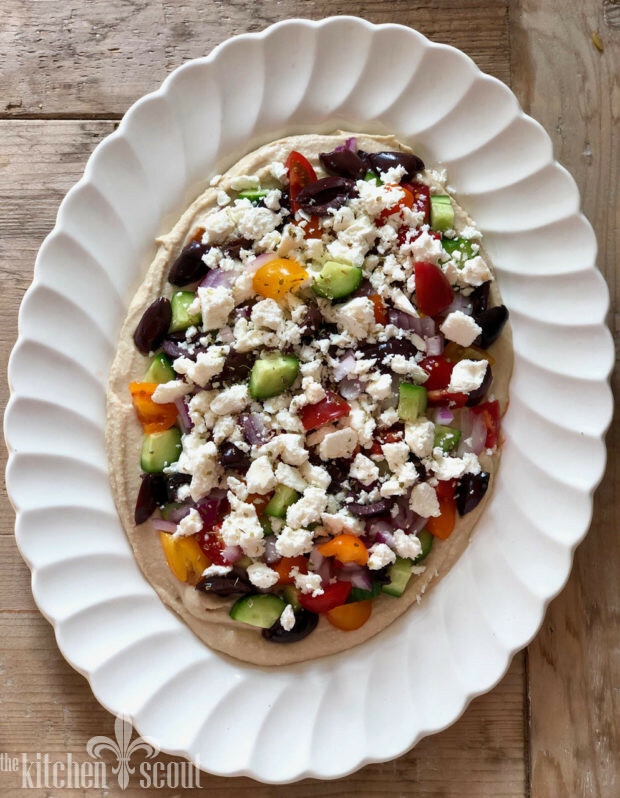 Top with cucumbers, tomatoes, onions and olives spread evenly over the hummus. Drizzle with a touch of olive oil and sprinkle with a little salt and pepper. Careful with the salt as the feta cheese is salty as well. Top the vegetables with the feta and drizzle with a little more olive oil and the dried oregano or Za'atar. You know how I feel about Samin…LOVE HER! And the Netflix series is great. I checked out those birdies and have two pair in my cart right now. I’m about halfway through Anthony’s book and plan to attend the event next year. Thanks for the recommendations. Val, I love your postings. Might be too late for thanksgiving this year, but I just made this and it’s great. Chop in order in food processor. Mix. sit over night. Yum. All chopping refers to food processor. Select your texture. I did about the fine-ness of the size of a pine nut. Takes 5 minutes once you get the food processor out of closet… Tart, fruity, great on turkey and much less sweet. With all the acid, would probably last months.